After Deadhorse, drove south down the Dalton until around 2 AM. It was so light out I could have forced myself to drive all night, but I noticed that my reflexes were getting worse, and I'd pay for it the next day. Had to try to get a least a couple of hours sleep. Left & Below: Yeah! Sheep Mountain Lodge & Hostel. Got there with 20 minutes to spare. The restaurant was just closing, but they put my order in, and I was happy as a clam! Food and a place to sleep--Heaven! Left: Took a little break to stretch my legs. Driving down the Dalton at midnight. Left: Doesn't look too comfortable. Had gotten up around 5am and left from Coldfoot to Deadhorse. Turned around and drove all the way back to a little past Coldfoot. Pulled over at 2am. After I closed the windows I had to find & kill all the mosquitoes that had gotten into the car or else they would have kept me awake. 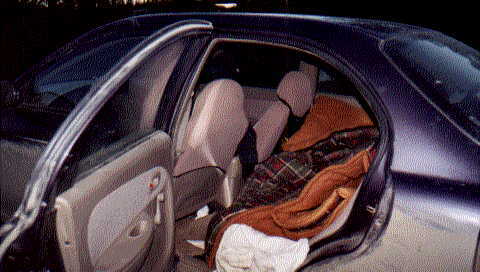 Locked the doors & left the keys in the ignition--just in case. Got up before 6am, and drove to Fairbanks. Thought about going back to Grandma Shirley's, but decided against it. Decided to drive to Denali (Mount McKinley) and stay at that hostel. 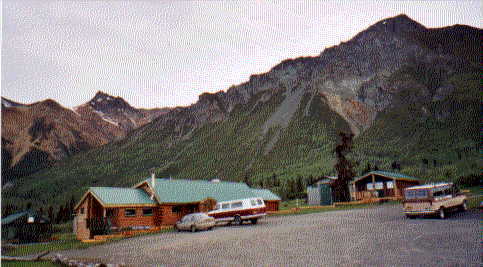 Got to the Denali Hostel around 3PM. The sign in the door said it was closed until 5pm. That gave me 2 hours to wait around. Couldn't do it. 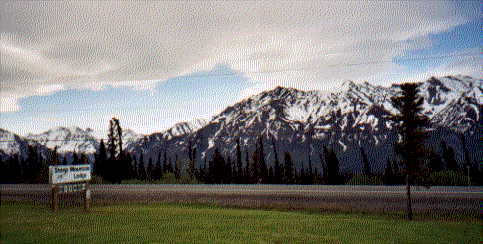 Headed toward Anchorage to stay at a Hostel there. 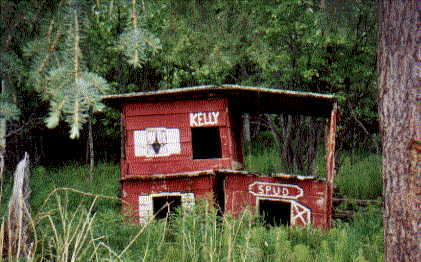 Right: Drove by 3 or 4 abandoned cabins scattered along the way. I bet they had stories to tell. 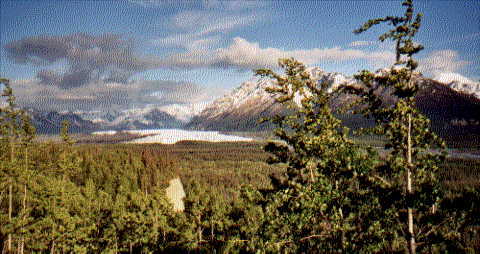 Above: Here's the Great Matanuska Glacier. Passed it on the way to Palmer. Wow! The road to Palmer was curvy & steep. And long. It was getting late. I had to get there before the hostel closed it's doors at 10PM! As I got closer to Anchorage I grew more leary of having to search for the city hostel. Often it's a pain to look for a hostel in a city. 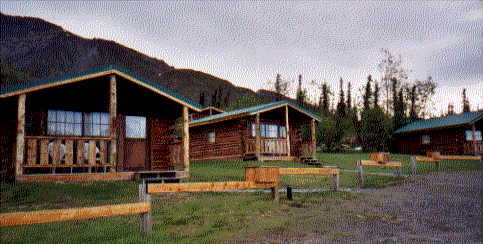 So once again I changed my mind and decided to go on to the next hostel--The Sheep Mountain Lodge & Hostel in Palmer, Alaska. That hostel would be up in the mountains, easy to find and uncrowded. Little did I know just HOW FAR in the mountains it was! 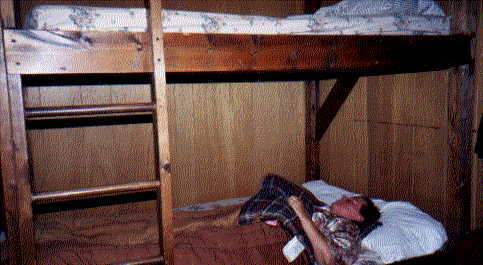 Right: The hostel was a co-ed dorm consisting of 3 bunk beds in one of these cabins. They were neat & clean. 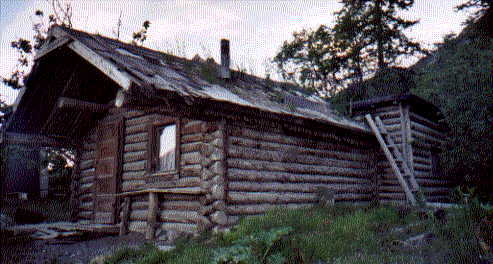 The other cabins were rented out to other tourists. Left: Nice heavy duty bunks with plenty of room to sit up (if I wanted to). I was happy to just conk out. So tired I could have slept on the floor and not known the difference! After breakfast the next morning, I saw the man from Israel standing on the side of the road with his backpack. The woman from Canada left just ahead of me. She passed by him. I don't usually pick up hitchhikers, but when he put his thumb up--I couldn't just drive right by him. Cars out there are few and far between. So I stopped, and picked him up, and I'm glad I did. There were two other hostellers in the cabin. One was a woman from Canada. She had her car too. The other was a man from Israel. He told me that he had just flown in from Israel to the Anchorage airport. He was making his way through Alaska, and then going into Canada. 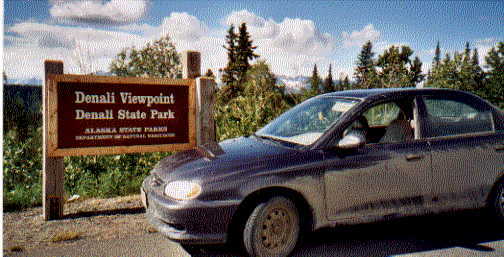 He was on his way to Valdez, The junction in the road for Valdez was about 60 miles down the road. 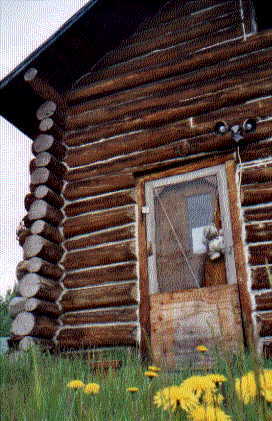 When we got there, I'd let him out so he could head south to Valdez, and I'd head north for Tok. That was the quickest 60 miles I've ever driven. The young man was very interesting. I thoroughly enjoyed the conversation.. He had a good sense of humor, was calm, & relaxed but at times there seemed to be a sadness about him. He told me that he had just got discharged from the military after 6 yrs. of active duty. That was one reason that he was on this trip--he had never been out of his country before, and he wanted to go someplace totally different. He also said that this was the first time that he'd been away from his parents, and he missed them and was a little homesick. During our conversation he told me about places he'd like to see. And I told him about the places that I'd been. I mentioned Rachel, Nevada when the jet pilot put on a little show for the tourists by breaking the sound barrier 3 times and how the huge flames came out of the back of the jet. Then the young man added in a soft voice, that he had seen many jet fighters. I asked him about his country. He said that all men had to go into the military for at least two years. I asked him if there was only one son in the family, would he still have to fight? He said, "Yes." But if a family had lost a father or brother in the war, then the other son could only serve if his parent signed a paper giving him permission. Also, he said that woman have to serve for at least 18 months. The don't have to go into ground combat, but they can become pilots. We reached the junction in the road and parted ways. If I'd had more time, I would have driven him to Valdez. That's another good thing about hostelling--I got to meet, and to talk to people who I otherwise would never have had the opportunity to talk to. And I'm sure that there were cases where people who otherwise might not have considered talking to me--had the chance to see that we are more alike than different. There were many, many times when hostelling allowed me to get to get a little glimpse into the lives of so many different kinds of people--different nationalities, different ages, and from all walks of life. There are so many "labels" people give each other. It's just human nature. Sometimes it's so engrained we don't even realize were doing it. I know that I've been guilty of it. I try not to be judgemental. And I've felt it when people have been judgemental toward me. Maybe because of the way I looks, or my age, or I'm too quiet, or whatever. That's just the way it is. Some people can see beyond the stereotype. Don't ever "assume" anything about anyone. Wow! Where'd all that come from! Well, I better get down off my soapbox before I fall down! 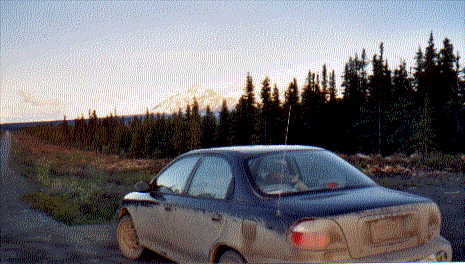 Left: Picture of my car parked in the drive way of the above abandoned cabin. 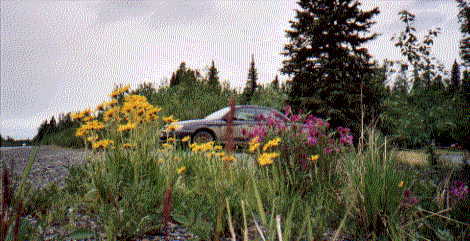 Lots of wildflowers in Alaska. Right: Now I know you can't see the linx in this picture--but it IS there! Really! It's sitting right there looking at me. It WAS closer. But it moved. Ya' know they do that sometimes. Now I'm going to tell the "Linx Story" whether you want to hear it or not...you can always skip over this part. But I gotta' tell it anyway--'cause linx sightings are extremely rare...and this one stopped and posed for this picture. How was he/she to know that I had a crappy camera? While driving down the deserted road near Slana, something ran across the road right in front of me. It was a pretty good size, light brown. And had a short, stubby tail like a boxer dog. There were no cars around, so I pulled over quickly and fumbled for my camera. The animal was some kind of a big cat. I thought it might be a bobcat or a linx. When I parked on the side of the road, the cat stopped running and turned it's head to look at me. I called, "Here Kitty, kitty!" Then to my surprize, it sat down and continued to look at me. For a second I thought, "Oh no, what if it comes over to the car? I did't think it really would, but it might. Should I pat it? It probably has pretty big claws. And it might bite." So I didn't call, "Kitty, kitty anymore--'cause I know cats just can't resist it--now matter what kind of cat they are. We stared at each other eye to eye for perhaps a good 30 seconds. I remember thinking, "Wow, am I lucky! Imagine eye to eye with a wild animal! It didn't run, it just sat there--it chose to sit there and exchange stares. Then an 18 wheeler came roaring by. I thought for sure the animal would run, but it didn't. It just crouched until the truck passed. But then another truck passed. I looked up and the cat was gone. Shortly after that, I stopped at a ranger station to use the rest room. There was a rack of post cards in the office. I looked through them and found a picture of the large cat that I had just seen. Picked the picture up and showed it to park ranger and told her what had just happened down the road from there. She said, "You saw a linx?" She said that I was very, very lucky to see one because they are very elusive. 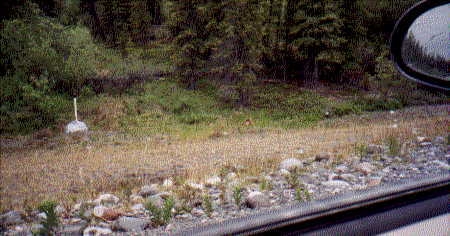 All the time that she had worked there as a ranger, she had never seen one, and her partner had lived there 10 years and had only caught a glimpse of a linx twice. For a linx to actually stop, sit down, and stare at a person is extraordinary! Her comments made me feel even more fortunate. Maybe it was the irresistable, "Kitty, kitty call"!